And the oil rout continues unabated.. Except the fossil fuel age may be coming to an end within five years.. not 15 to 30. This shift to a “technology” has many implications for energy but the most profound one is very simple. As a technology, more demand for renewables means lower prices and higher quality constantly evolving for a long time to come. The resources they compete with – coal, oil and gas – follow a different pattern. If demand kept increasing, prices would go up because the newer reserves cost more to develop, such as deep sea oil. They may get cheaper through market shifts, as they have recently, but they can’t keep getting cheaper and they can never get any better. In that context, consider this. Renewables are today on the verge of being price competitive with fossil fuels – and already are in many situations. So in 10 years, maybe just 5, it is a no-brainer that renewables will be significantly cheaper than fossil fuels in most places and will then just keep getting cheaper. And better. With which economy Paul….? Come the next oil crisis, the economy will simply grind to a halt. Paul is also keen on electric cars…. Within a decade, electric cars will be more reliable, cheaper to own and more fun to drive than oil driven cars. Then it will just be a matter of turning over the fleet. Oil companies will then have their Kodak moment. Coal will already be largely gone, replaced by renewables. The carnage continues in the U.S. major oil industry as they sink further and further in the RED. 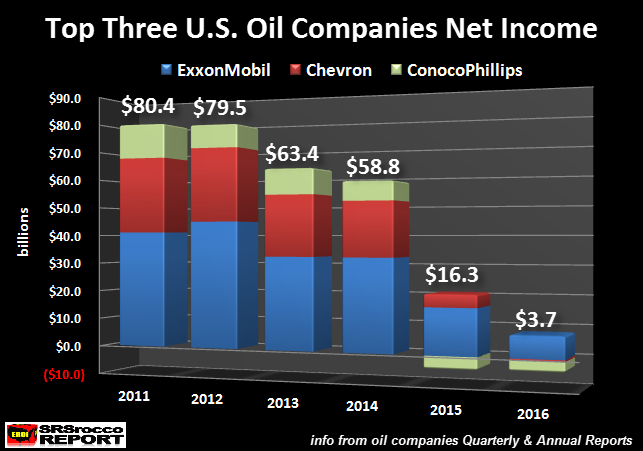 The top three U.S. oil companies, whose profits were once the envy of the energy sector, are now forced to borrow money to pay dividends or capital expenditures. The financial situation at ExxonMobil, Chevron and ConocoPhillips has become so dreadful, their total long-term debt surged 25% in just the past year. Unfortunately, the majority of financial analysts at CNBC, Bloomberg or Fox Business have no clue just how bad the situation will become for the United States as its energy sector continues to disintegrate. While the Federal Government could step in and bail out BIG OIL with printed money, they cannot print barrels of oil. Watch closely as the Thermodynamic Oil Collapse will start to pick up speed over the next five years. A total of 351,410 jobs have been slashed by oil and gas production companies worldwide, with the oilfield services sector bearing much of this burden, according to a new report released this week. The report, based on statistical analysis by Houston-based Graves & Co., puts the number of jobs lost in the oilfield services sector at 152,015 now—or 43.2 percent of the global total since oil prices began to slump in mid-2014. A report published earlier this month by Haynes and Boone found that ninety gas and oil producers in the United States (US) and Canada have filed for bankruptcy from 3 January, 2015 to 1 August, 2016. Approximately US$66.5 billion in aggregate debt has been declared in dozens of bankruptcy cases including Chapter 7, Chapter 11 and Chapter 15, based on the analysis from the international corporate law firm. Texas leads the number of bankruptcy filings with 44 during the time period measured by Haynes and Boone, and also has the largest number of debt declared in courts with around US$29.5 billion. Forty-two energy companies filed bankruptcy in 2015 and declared approximately US$17.85 billion in defaulted debt. The costliest bankruptcy filing last year occurred in September when Samson Resources filed for Chapter 11 protection with an accumulated debt of roughly US$4.2 billion. Then we have Saudi Arabia’s decision to cut production to manipulate the price of oil upwards. So far, it appears to have reached a ceiling of $58 a barrel, a 16 to 36 percent increase over the plateau it had been on for months last year. But this has also come at a cost. The world hasn’t really caught on yet, but OPEC is in serious trouble. 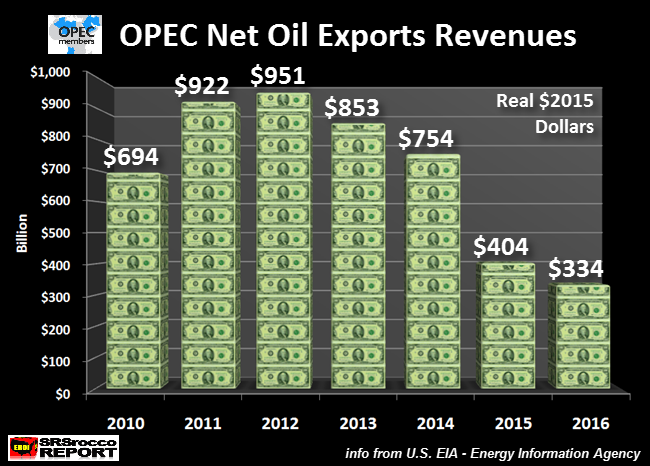 Last year, OPEC’s net oil export revenues collapsed. How bad? Well, how about 65% since the oil price peaked in 2012. To offset falling oil prices and revenues, OPEC nations have resorted to liquidating some of their foreign exchange reserves. The largest OPEC oil producer and exporter, Saudi Arabia, has seen its Foreign Currency reserves plummet over the past two years… and the liquidation continues. For example, Saudi Arabia’s foreign exchange reserves declined another $2 billion in December 2016 (source: Trading Economics). Now, why would Saudi Arabia need to liquidate another $2 billion of its foreign exchange reserves after the price of a barrel of Brent crude jumped to $53.3 in December, up from $44.7 in November?? That was a 13% surge in the price of Brent crude in one month. Which means, even at $53 a barrel, Saudi Arabia is still hemorrhaging. The mighty OPEC oil producers enjoyed a healthy $951 billion in net oil export revenues in 2012. However, this continued to decline along with the rapidly falling oil price and reached a low of $334 billion in 2016. As I mentioned before, this was a 65% collapse in OPEC oil revenues in just four years. Last time OPEC’s net oil export revenues were this low was in 2004. Then, OPEC oil revenues were $370 billion at an average Brent crude price of $38.3. 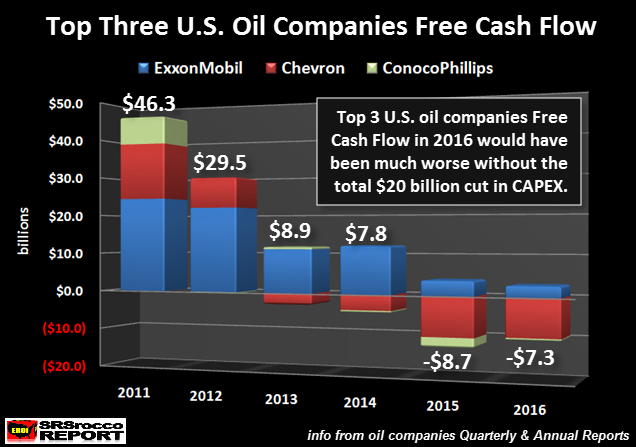 Compare that to $334 billion in oil revenues in 2016 at an average Brent crude price of $43.5 a barrel……. This huge decline in OPEC oil revenues gutted these countries foreign exchange reserves. Which means, the falling EROI- Energy Returned On Investment is taking a toll on the OPEC oil exporting countries bottom line. A perfect example of this is taking place in Saudi Arabia. The BLUE BARS represent Saudi Arabia’s foreign exchange reserves and the prices on the top show the average monthly Brent crude price. In January 2016, Brent crude oil was $30.7 a barrel. However, as the oil price continued to increase (yes, some months it declined a bit), Saudi’s currency reserves continued to fall. This problem is getting bad enough that for the first time ever, the Saudi government has, shock horror, started taxing its people…. How long before Saudi Arabia becomes the next Syria is anyone’s guess, but I do not see any economic scenario conducive to Paul Gilding’s “Great Disruption”. The great disruption will not be the energy take over by renewables, it will be the end of freely available energy slaves supplied by fossil fuels. I believe Paul has moved to Tasmania, in fact not very far from here….. I hope he’s started digging his garden. An attempt to put a two-year moratorium on permitting more wind energy installations, with the argument based on the shutting of coal-fired power stations – but the CEO of the company whose plants are being shut down sings the praises of wind energy as the new baseload power. And lots of other good comments around this issue. Am really enjoying following your progress there, and amazed by what you are achieving. I’ve been very quiet on the sustainability front for quite a while – just emerging from two and a quarter years leading a community fight against a proposed motocross facility in our area. Hi Gordon…… hasn’t changed, it’s damnthematrix at riseup dot net. The US has too much invested in Saudi Arabia to allow it to collapse, unless the current regime becomes so brutal they can no longer support it. Besides, the Saudis are the US’s local hit team and are very well equipped. message to self, get bike and trailer repaired while parts are still available. I have no doubt Saudi Arabia WILL collapse…… something like half their population is under 20, and most of them don’t work, happily supported by the government with their oil revenues. How long can this last? And what happens when the Saudis can no longer afford to do this? As soon as the export land model hits home, it’s all over Rover…… USA or no USA. After all, why would the US support another Middle East country that can’t sell it oil…… by 2020, SA will be consuming 60% of its production…. Paul is from Tassie originally I believe. If you take out “financials” the real economy of the world has been shrinking. All these graphs show the collapse of the economy as much as they show the collapse of oil. I’d bet the rosey-picture peddlers would take your charts and use them to bolster their point. See? The oil industry *is* in its death spiral, mostly because of renewables. They’d also say that if oil hit a crisis, centralised gov’t could ration in such a way that production of renewables kept going. By the way, all those financials will reverse nicely with a price increase. And what’s available for export from SA can be influenced externally too.